Your Morning Cup: Merry Christmas! It’s been a frozen week here in Seattle, and if you haven’t seen us on the news chances are you’re not watching the news! It’s been the coldest and snowiest December on record here! I left you last Thursday with Matt and I cozied up at home next to the fire and me unable to drive my car anywhere. Well its Christmas and I still haven’t moved my car! It snowed Thursday, Friday, Saturday, and Sunday! And we had more this morning and are due for more tonight! Its insane! By last weekend I was going stir crazy so I strapped on a backpack and left Roy in his crate while walked to the grocery store. By the time I got back there was a note on the door from our neighbor who has met Roy and really liked him. He was letting me know that the whole 3 hours I was gone Roy had barked! I went with Roy to apologize, but he said he didn’t mind that much and loved on Roy, and just wanted to let me know he does NOT like that crate! Monday came and Matt drove me to work. He’s been parking at the bottom of Queen Anne hill and walking up so he could continue driving to work. 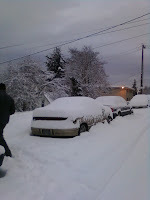 Luckily a coworker gave me a ride to the bottom of Queen Anne hill and I walked home. 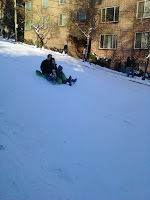 That street was closed, and people were actually sledding, skiing and snowboarding down it! That was only a two-mile walk, and I got some Christmas shopping done so it was nice. Tuesday Matt dropped me off again, and I got a ride with a co-worker who dropped me off downtown as I assured her I was going to get some Christmas shopping done and could ride the bus home. The buses are clean, efficient, and the stop is just at the bottom of the street where I live. I browsed around Pike Place Market, picking up stocking stuffers and a unique gift for Matt before heading to the bus stop. As I approached I noticed about 30 people surrounding the little stop, all looking in the direction of the coming bus. A little perturbed, I pulled my scarf higher in the freezing night air and waited for 5 minutes…10 minutes…then 20. Finally a bus came, but it was amazingly packed tight. As the bus pulled up, the throng of people I was in—by now at least 40—pushed forward in a mass to the opening doors of the bus. A few people got off, then there was a maddening jostle of bodies as people tried to squeeze themselves into the already full to capacity bus. Elbows in your side, feet sloshing in the frozen slush as we pushed forward like a reverse birth. I could swear I saw one man frothing at the mouth. As I was towards the back of the crunch, I finally gave up and made my way through the crowd and began walking. I walked nearly 4 miles—from Downtown to Queen Anne—carrying my purchases and trying to walk fast enough to keep warm but slow enough not to slip on the packed snow and ice. It took me about an hour and a half (and yes it was uphill) and I wasn’t the only one walking. At one point a young man carrying a bouquet of Christmas flowers hurried by me at a quick pace. “How far are you going?” he asked. “Queen Anne,” I replied—this still being about 2 miles out. As he passed me I called, “Hope you’re not headed to Ballard!” (which is further north and across the bridge from Queen Anne. “Nope, Magnolia,” he called back. Poor guy—depending on where he lived in Magnolia it was anywhere from 3-7 more miles! I was carrying my bags and my $1 mittens weren’t quite doing their job, so I figured I would get a cup of coffee to keep me warm. Wouldn’t you know it? Only ONE coffee shop my whole walk home and it was CLOSED! This is Seattle—the birthplace of coffee shops! With my scarf wrapped around my nose to keep my face relatively warm, I waddled and slid my way home. 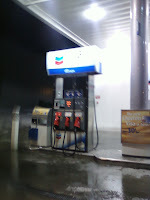 One amazing sight was walking past two gas stations with every pump CLOSED because the weather’s been so bad that gas trucks haven’t been able to get through! When I took Roy out when I got home he was more than excited, and we played in the soft untouched snow in the parking lot—us both losing our footing on the steep hill and sledding down together in a mass of wet snow and sprawling legs. He loves finding an untouched patch, pouncing in it, then hopping to another one—it’s like he’s trying to make snow angel dogs! That night Matt’s parents, Dave and Beth, and his sister Katie got in from Groveland. This is Matt’s first Christmas with them in 3 years! We’ve stolen him away the past few times! They love our apartment and Roy, and he was more than excited to have more people in the house to love on! The next day Matt was off, so I could drive his car to make it in to work on Christmas Eve. It was snowing/raining pretty good, but the roads were a bit clearer and the temperature was above freezing so things were thawing out. It still was an adventure—my first time driving in snow! I could feel the car’s 4 wheel drive kick in quite often as I trudged over the leftover snow packed on the streets and highways. After work I drove to the market in Ballard to load up on a ton of groceries—and let me just say that its quite the experience pushing a cart LOADED to the max with food and firewood over mushy snow and ice in the pouring rain! I was in front of the cart, dragging it like a mule when a kind man offered to help me get the last few feet to the car. Driving home I felt quite accomplished—enough so to drive through the snow to park in Matt’s usual spot for the first time in a week! Christmas morning rolled around and I was awakened by Roy’s excited nose shoving me under the covers like a kid saying, “Get up! Get up! Its Christmas morning!” He’s never that persistent in getting me up…I think he knew he had some good treats coming! We ate Beth’s cinnamon rolls and listened to Christmas music by the fire as it rained and snowed outside. As my main Christmas present from Matt, Roy Boy had a big red bow tied around his neck and left it all day! We all opened gifts and exchanged hugs and thanks and all felt pretty spoiled. Roy opened his new toy that’s a puzzle he has to work at to get his food, and had no problem learning how to tear open a present! Later we got dressed and headed to Sacred Heart Church for Christmas mass. The Palmers grew up Catholic to it was a little bit nostalgic for them, and a wonderful, sacred experience for me. It was great singing old Christmas carols there surrounded by beautiful stained glass windows and a ton of candles. The priest was a jolly fellow who warmly reminded us that everything we do at Christmas points to the birth and gift of Jesus, and Him being our connection with God. Back at home we all collapsed into some state of nap or relaxing. I passed out on the floor before heading to the bed, Matt and Katie lounged around watching who knows how many episodes of The Office, and Dave beat us all by taking a sound 4 hour nap! For Christmas dinner we feasted on ribeye roast, mashed potatoes, sautéed zucchini and mushrooms, and soft rolls. Top it off with some sugar cookies and ice cream and Christmas was complete. We hope you all had warm, loving Christmases, and enjoy your time with your family!